This is only a visual. Real sign up is on the sidebar! Everyone's busy these days, so we wanted to make it as easy as possible for you to read the Bryant Park Blog. 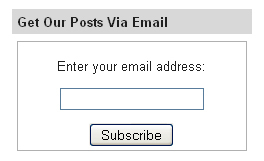 Enter your email address and hit 'subscribe' to start having our blog posts delivered straight to your email. You'll be able to catch up with the park from your desk or on the go. And since we're on the topic of subscribing, if you want to hear more from us, including weekly event listings or our company newsletter, click here to sign up and have them delivered to your inbox, too.